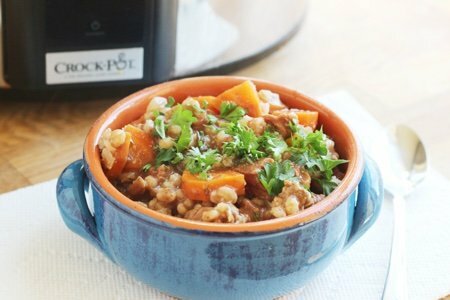 Slow cooker beef and barley soup is a real winner on a winter’s day. I had forgotten all about it until I went out for New Year’s Eve. There is a celebration in a town near by that features music and dancing – and they had a soup stand with this soup. It was perfect for a cold winter’s night. I should warn you that I am on a soup kick. This year, I have featured low carb chicken vegetable soup and slow cooker sausage and gnocchi soup. I love soup because it warms you up, hydrates you, and you can pack a bunch of vegetables in it without much complaining. This soup features barley which is also known as “pearl barley”. I found it next to the dried beans in my supermarket. I thought it would be next to the rice but no dice. Pearl barley has been polished, or “pearled” to remove some or all of the outer bran layer along with the hull. Most of the barley found in the typical supermarket is pearl barley. Although it is technically a reﬁned grain, it’s much healthier than other reﬁned grains because (a) some of the bran may still be present and (b) the ﬁber in barley is distributed throughout the kernel, and not just in the outer bran layer. For this recipe, use barley or pearl barley but not quick pearl barley. For the rest of the soup, you want to buy chuck steak which is easy to cut up and lots of vegetables. The barley in the soup makes it far more heartier and comforting than it would be without it. The texture is like pasta but it is closer to a whole grain. If you haven’t tried it, you shouldn’t be afraid. It is delicious! I promise. This soup is a bit higher in sodium than I like but I cut the salt in half and I don't see it tasting right without this amount of salt. Any thoughts you might share on this would be helpful! 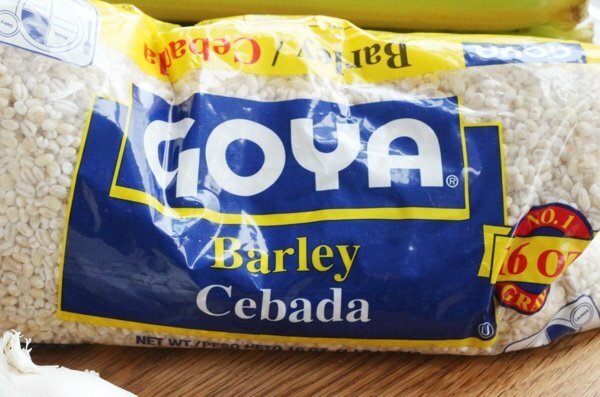 Do you cook with barley? What do you think of it? 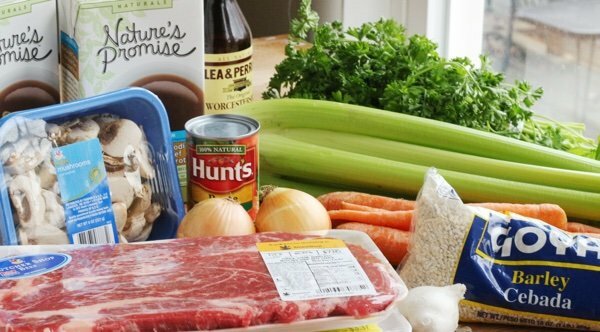 Place beef, onion, celery, carrots, mushrooms, garlic, barley, broth, tomato paste, Worcesershire sauce, salt, and pepper into a large slow cooker. Cook on high for 4 hours or low for 8-9 hours. Looking to reboot your eating habits? This low carb chicken vegetable soup is for you. Would you be able to used non-pearled barley for extra fiber or would it be too hard/crunchy? I love barley! I just discovered it this fall when I gave up sugar and other simple carbs(I'm in the prediabetic range). It has a delicious, kind of nutty flavor and a slightly chewy texture (at least that's the way I cook it). It's so good. I don't know why it's not in more common use. The soup sounds great -- I'm going to make it. @ Amber, non-pearled barley mainly needs to be cooked longer. Just check the package for amount of time but the long simmering of a soup really makes it a mute point. It mainly matters when making a barley pilaf or risotto (both are delicious). The health benefits of barley make it very worth experimenting with as the type of fibre it has helps with cholesterol and blood sugar management. @ Snack Girl, I find that you can cut the salt/sodium in any recipe that calls for beef or beef broth by adding ground dried mushrooms. I buy a huge jar of dried mushrooms and grind up a couple handfuls in a coffee grinder that I only use for mushrooms and spices. When I want a nice earthy salt-free punch in a recipe, I add a few tablespoons of the "mushroom powder". Mushroom Power? Magic Mushrooms? Sounds yummy and I love the above mushroom idea! My dietician suggested no more than 400-450 mg sodium in any serving of soup, and that can be hard to find! Do you think I can use farro instead of barley without changing anything else? Susanne, where do you get the dried mushrooms? I really like that idea. This sounds really good! I love soups and stews this time of year. I also add a little ground flaxseed to my soups to increase the fiber and Omega-3 fatty acids. You can find the dried mushrooms in a huge container (The Wild Mushroom Co. 454 g) at Costco and a smaller container at Your Independent Grocers/Loblaws and maybe other places (S & F Food Importers, 30 g/1.1 ounce) in Canada. You can also get smaller packages like plastic envelopes but I find them only useful for 1 recipe of whatever. Might be nice to try the smaller packages first though to see if you like the mushroom powder. Snack Girl! 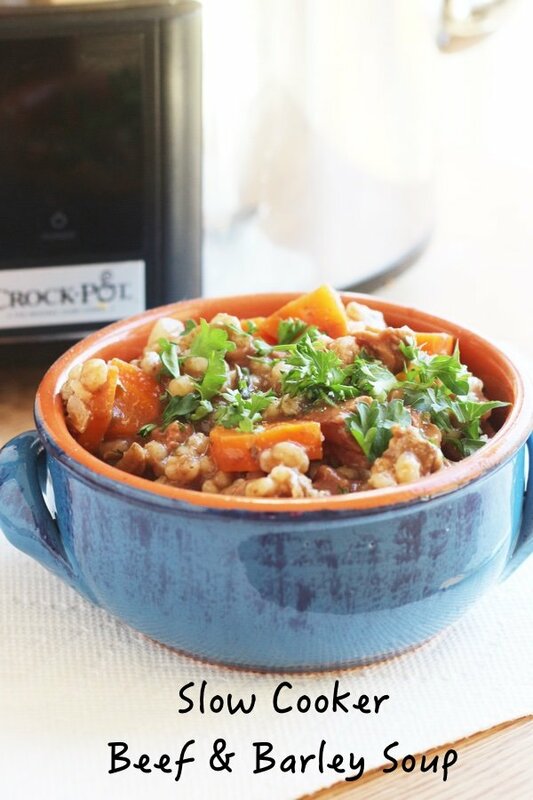 I love beef and barley soup and this reminds me that I need to make it, especially since we are actually having cold weather in San Francisco. Thanks for the recipe! Lisa, I love Beef Vegetable Barley Soup and it was already on next Tuesday's Menu! Barley also goes into my Vegetarian Lentil soup. When I open my pantry I have a shelf dedicated to mason jars filled with grains, beans and small pastas. It keeps me inspired. Cooking with barley lends a wonderful hearty creaminess to soups, so much so that I prefer more liquid when using barley. I use ground angus beef [about 1 lb], celery, carrots, onion, mushrooms and two cans stewed tomatoes [blended] in lieu of tomato paste, 10c water, 1c barley, and optional corn and/or green beans as the mood strikes. The beefy-tom-veg-barley combo makes an addictive homey soup that reminds one of childhood :) The whole soup comes together relatively quickly after all the dicing, even using the stovetop method. Its also fantastic with no meat at all. And its full of healthy fiber-over 30grams in 1 cup of raw barley! I like a "soupier" soup than this appears. Would adding more broth derail the soup? Judi-Me too. I have no problem using 10 cups plus two 14oz cans of stewed tomatoes (which I pre-blend). Beef add lots of flavor and barley adds a lot of thickness so most often another I add another couple cups of water after barley cooks. I find the soup to be perfect, sometimes I might add 1 teaspoon of Better Than Bouillon but its not necessary. Mushrooms are also beefy. @Judi - This photo is of the day after I made it - and it was more of a stew. More broth would make it perfect! @Naomi - Yes! Use farro and it will be very similar. @Amber - I think it would work but I haven't tried it. It cooks for a long time so it should be okay. @Suzanne - Thanks so much for the ground mushrooms concept. I can't wait to try it. Thanks for all of your great questions!! OutSide Then Solid. Because Of its' Outward Slipperiness I Decided To Pair It With Pesto Sauce. The Olive Oil Adds Flavor To The Slipperiness, Barley With Pesto Sauce. My Other Favorite Is The ALlReady Well Known Chicken Barley Soup/Stew. Have always loved beef barley soup. Just made it this past weekend. Will try your recipe. Also love mushrooms so this should be good. Would sauteing the beef before hand add more flavor? Love barley, hate the texture of mushrooms. Will have to look for dried mushrooms. Great idea. I like the idea of the mushroom powder to replace the salt, I have been trying to go as low sodium as possible in my diet. I have found no salt added stocks, and several different canned tomato products which have been the mainstay of my meals. I really don't miss the flavor, and use Mrs. Dash when I do. Thanks for this great recipe, I have experimented with wheat berries, and look forward to using the barley. I'm thinking I should be able to make this without a slow cooker. Does letting it stew slowly for about 3 hours sound right?